With the boys over their illness it was time to try to return to somewhat normal routines and diets. 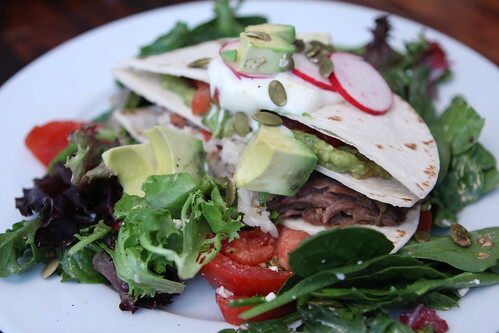 I thawed out some leftover braised short ribs and made these tortilla stacks with an avocado, radish, and tomato salad. I also used some guacamole made by Uncle Doug in the tortillas. Temperatures climbed into the 60s for a day and I was even able to fire up the grill for the first time. 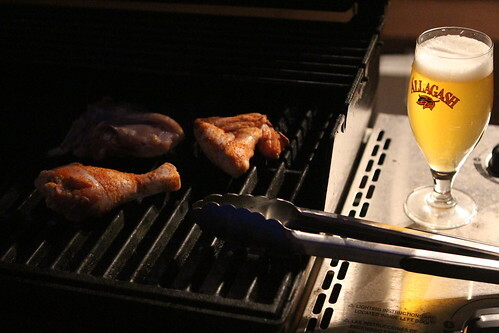 The grill is mostly repaired and I was able to quickly season some chicken and grill it up. It was an amazing experience to get out there and grill on my own damn grill, on the deck of my own damn house. It certainly beats loading all my ingredients into a giant Rubbermaid tub and schlepping it around behind the house to do a little bit of grilling. After being better Martin threw up at day care and had to come home. 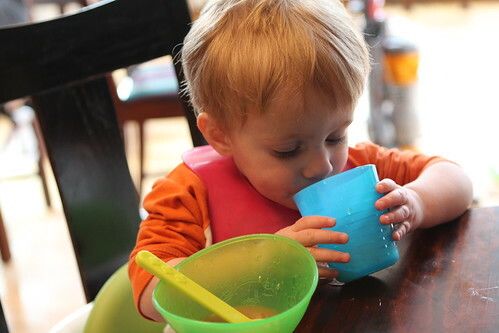 Of course he was completely fine so we came home where he ate his body weight in oatmeal and practiced drinking from a cup. Last Saturday it actually got to 80 degrees and we quickly snatched this opportunity to have dinner and even hang out a little bit outside. 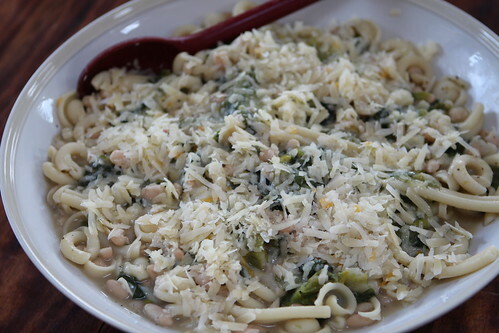 Grandada made this fantastic pasta with white beans and escarole. 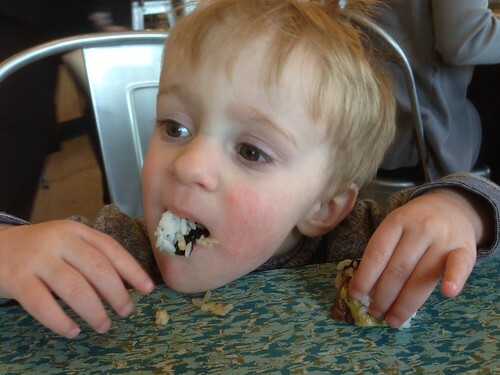 There was cake after dinner that was mostly wrestled away from adults by greedy little piglet toddlers. 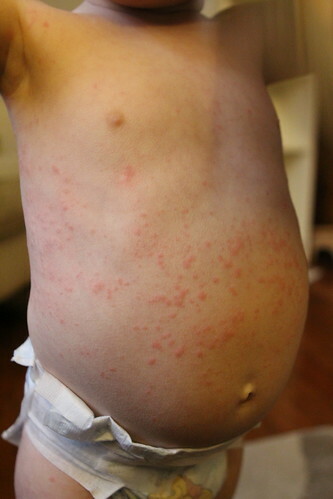 On day 7 of amoxicillin Martin broke out in a huge, full body rash. Just like his mother he is not allergic to this terrible antibiotic. The doctor told us to take him off of it. We did. The rash went away. Then the doctor said to give it to him again. We did. The rash came back immediately. Grandad returned form a work function where he got these little toys that entertained the guys immensely. Martin felt the term "Wow!" was not adequate enough to express his amazement and coined the term, "Big wow!" They liked them so much that I sent them to day care with them one day because the refused to let them go. When I picked them up they toys were cracked into several pieces and barely lit up when the buttons were pressed. On Martin's sick day we went to the playground where he explored on his own and even did the slide without any help from me. He was also fascinated with the gazebo in the center of the park but was confused why there was no ceiling fan like at Grandma and Grandad's. 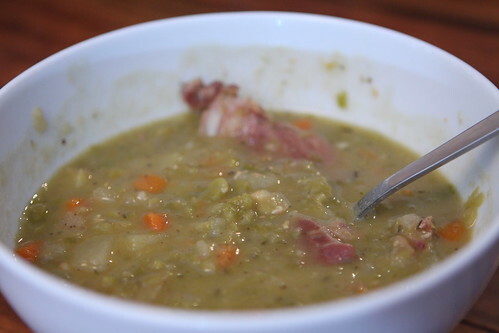 Before Jen left for her trip to Seattle for work I made this ham and split pea soup from frozen ham leftover from Christmas. It came out great. The boys even enjoyed it despite the fact that it was neither cheese nor a cookie. 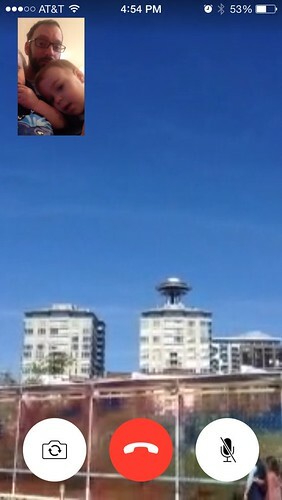 Jen FaceTimed from Seattle and showed us her lightly obscured view of the Space Needle. This went about as well most FaceTime calls go. In other words, it ended with both of them repeatedly hanging up on Mummy and fighting over the phone. One night while Jen was away they both asked, one after the other, to take their shirts off. Then they spent the entire night walking around like little two-foot-tall Vladimir Putins playing with their Zebra and looking at my guitar. Martin's hatred of bedtime grows with each passing day. He has now taken to selecting no fewer than a dozen books before bed. No matter many you read he puts up a finger and says, "One more book! One more book!" This would be fine except that he breaks this promise every time by repeating his mantra. One more book! One more book. While Jen was away there was a lot of Curious George that was consumed via Netflix. It was lazy of me but it was the only thing that could buy me fifteen minutes to throw dinner together. Elliott caught a glimpse of Elmo for Sesame Street as I passed through the shows and demanded to watch. I was surprised that Elliott seemed to know every character on Sesame Street without having ever watched a single episode. The above video shows that he is able to identify almost everyone. The problem with Sesame Street is that it does not really feature enough Elmo for either of their likings. I tried to explain the concept of an ensemble cast to both of them during one of their Elmo fits but I'm not sure they entirely grasped it. The night before Jen returned, two days after our 80 degree day, it snowed all over our nice new patio furniture and, presumably, the rest of the surrounding area. It's to be expected during a seasonal transition. 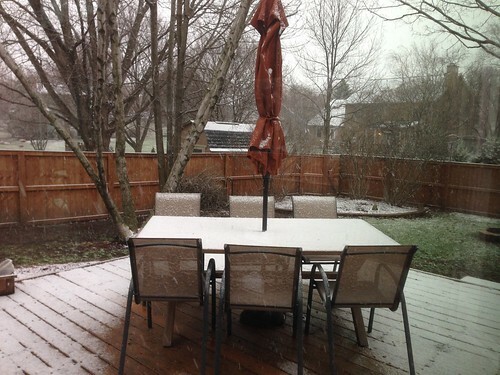 It was fun to see friends on Facebook from Rhode Island, Massachussetts, Maine, Vermont, New Hampshire, Connecticut, New York, New Jersey, Pennsylvania, Maryland, North Carolina, Ohio, Illinois, and Michigan all lament: "__ degrees two days ago and it's snowing today! Only in [INSERT STATE NAME HERE]." Miraculously, after Jen's return, I was able to throw together a couple of dinners that were about 25% of the level of the dinners I was making a year or more ago! 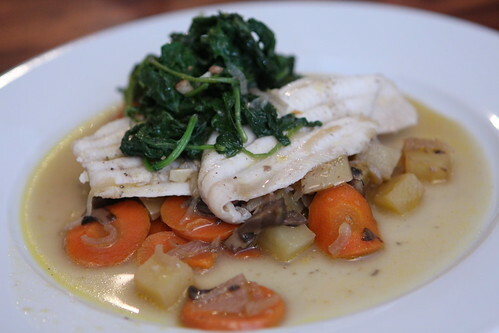 I made some very nice poached flounder potatoes, carrots, garlic, shallots, garlic braised kale, and a sauvignon blanc butter sauce. 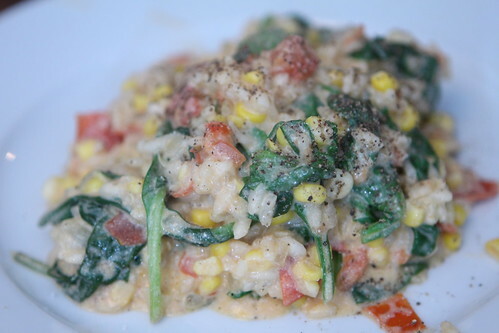 I also used some leftover corn, tomato, spinach, and ricotta to make this risotto. The boys had a fever yesterday and had to stay home from day care. 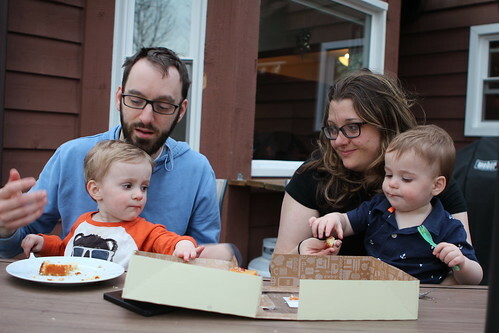 Jen took them to meet me for lunch where Elliott enjoyed a ham and gruyere strata. Martin had no interest in the strata but as soon as Jen looked away he stole a giant piece of her sushi and scarfed it down. Apparently, like his father as a child, he may have developed a strange pickiness yet desire to eat raw seafood. 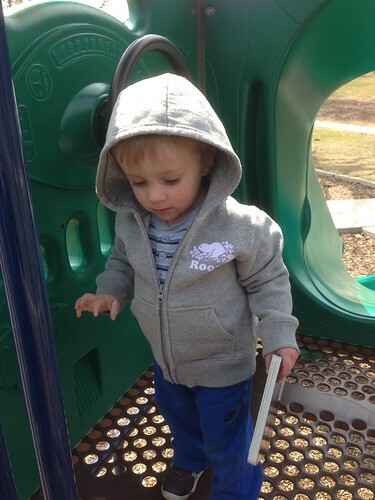 It must be the Rhode Island in his genes.